"We hold these truths to be self-evident, that all men are created equal, that they are endowed by their Creator with certain unalienable Rights; that among these are Life, Liberty and the pursuit of Happiness." On April 13, 1743, Thomas Jefferson was born near present-day Charlottesville, Virginia. A lawyer by trade, Jefferson was a member of the Continental Congress and in 1776 was selected to draft the Declaration of Independence. Jefferson would serve as governor of Virginia and Benjamin Franklin's successor as the minister of France. In 20-years time, Jefferson became vice president after losing to John Adams by a mere three electoral votes. Four years later, Jefferson became our nation’s third president. Jefferson's achievements as president include the purchase of the Louisiana Territory and his support of the Lewis and Clark expedition. Both of these successes are memorialized in the U.S. Capitol Building. 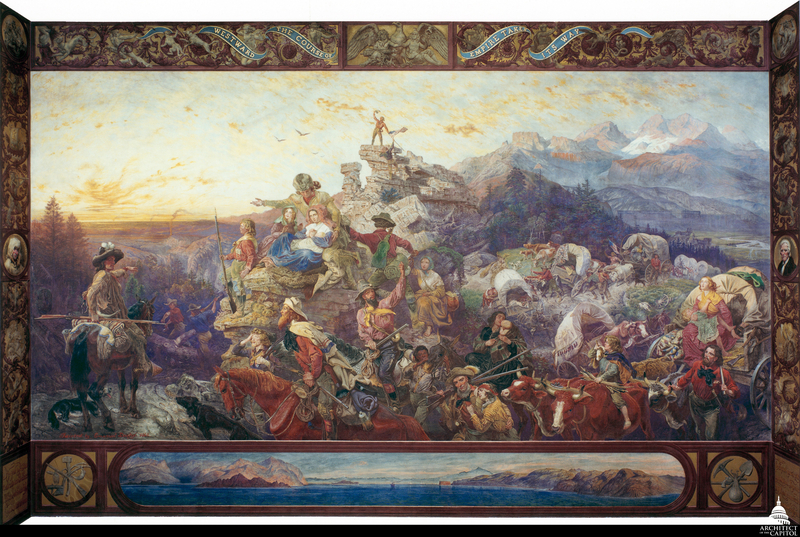 In the west stairway of the U.S. Capitol Building (House Wing), Emanuel Leutze's mural Westward the Course of Empire Takes its Way celebrates the western expansion of the United States and includes a portrait of William Clark who, with Meriwether Lewis, lead a survey of the Oregon Territory. 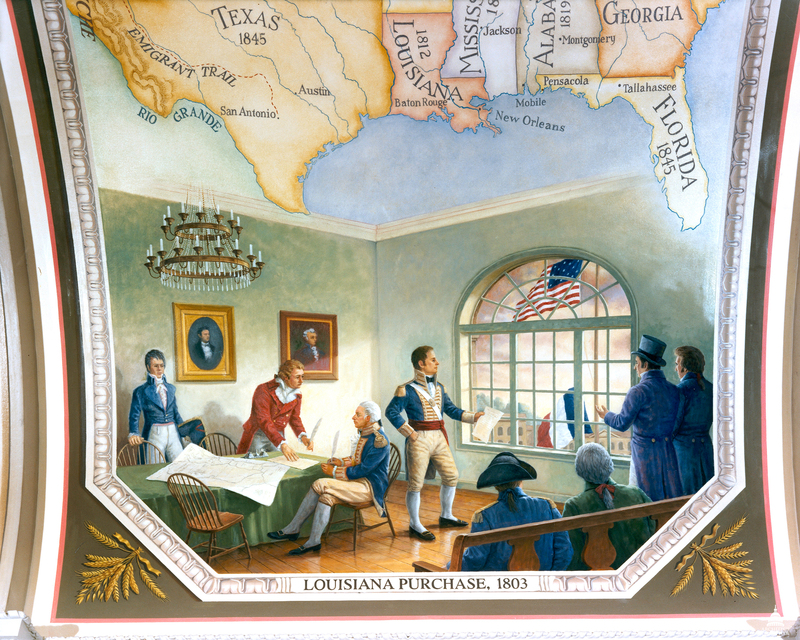 The Cession of Louisiana, located in the Brumidi north corridor on the Senate side of the U.S. Capitol, depicts the meeting of Robert Livingston, James Monroe and Marquis Barbe-Marbois in 1803. While in the Westward Expansion corridor, designed by Allyn Cox, and located in the western north-south corridor of the House side of the U.S. Capitol includes the third signing of the Louisiana Treaty (pictured above), which occurred in New Orleans. Jefferson himself is memorialized in 10 pieces of art in the U.S. Capitol Building. Not surprisingly, Jefferson is featured prominently in artist John Trumbull's Declaration of Independence. The painting is located in the Rotunda and is viewed by more than two million visitors every year. Also in the Rotunda is a statue of Jefferson depicted in his role as author of the Declaration of Independence. The artist Pierre-Jean David d'Angers created a sculpture of this Founding Father in a dynamic contrapposto pose with his right hand holding a quill pen. The pen's tip points to Jefferson's left hand, which holds the famous document. The words on the page, which are readable, were created by pressing type into the statue's clay model. But did you know that a third representation of Jefferson is also in the Rotunda? Approximately 58 feet above the floor, the frieze contains a painted panorama depicting significant events in American history. 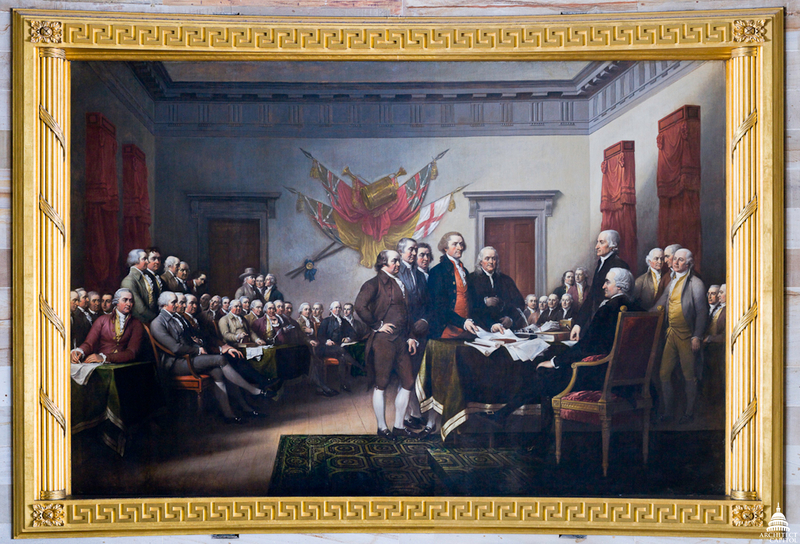 Look closely and you can see an idealized depiction of the principal authors of the Declaration of Independence – John Adams, Thomas Jefferson and Benjamin Franklin – reading the document to colonists. The frieze is painted in grisaille, a monochrome of whites and browns to resemble sculpture. Artists Constantino Brumidi designed the frieze and Filippo Constaggini completed the section known as Declaration of Independence. The remaining seven pieces of art that include or feature Thomas Jefferson are sprinkled throughout the Capitol – including an oil on canvas portrait, a relief portrait in the House Chamber (pictured above), a couple of murals and a vice presidential bust – all of them honoring the contributions and successes of our nation's third president. 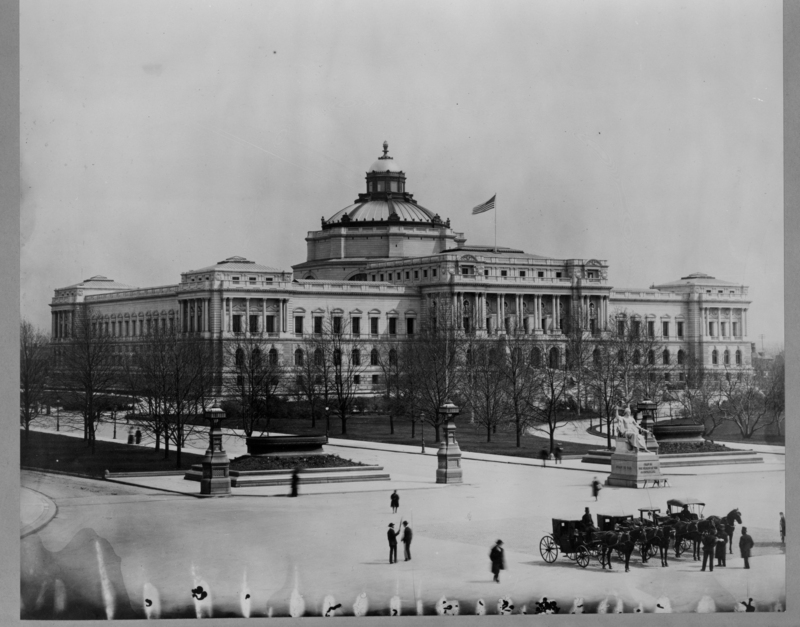 The Library of Congress Thomas Jefferson Building opened to the public in 1897 and was considered the most beautiful, educational and interesting building in Washington. 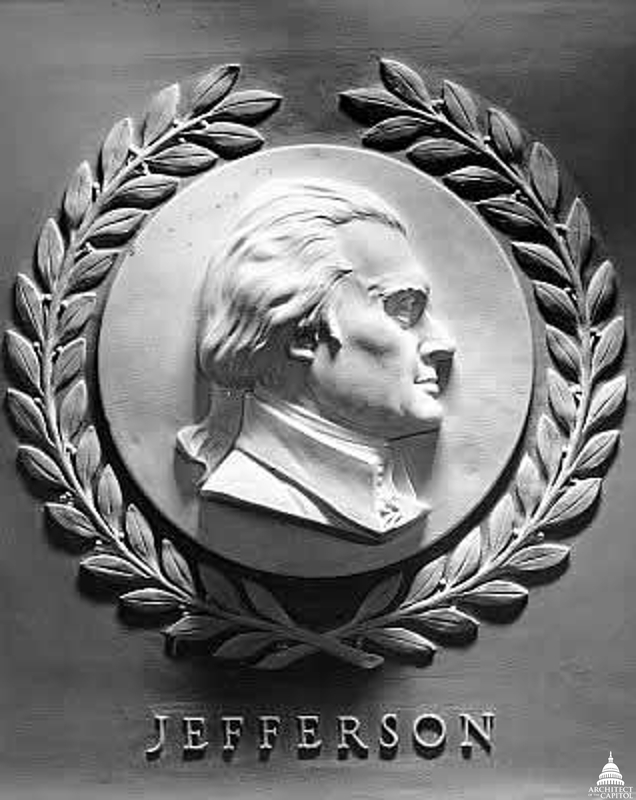 Jefferson was succeeded as president by fellow Virginian James Madison in 1809. Over the course of the next 17 years, Jefferson would sell his beloved collection of books to the government forming the nucleus of the Library of Congress and he would found the University of Virginia. Fittingly, Jefferson died on July 4, 1826 – the 50th anniversary of the adoption of the Declaration of Independence. His contributions to our nation are fondly remembered and for generations to come, he will be admired in the art of the U.S. Capitol. What a great article to celebrate Jefferson's birthday! Thanks, Erin, for the excellent summary of his contributions and depictions in the Capitol. Thank you! I love this! It was like a scavenger hunt of my mind recalling the spaces that are occupied with 'Jefferson art' throughout the Capitol. A few that I had not noticed before......wonderful! Now, how about a search for the present day broadway "darling"and oh so in demand......Alexander Hamilton? Good stuff. I like the pictures.